Grant Fraser, Modern Languages teacher, describes a typical day teaching in a British School in Tokyo. 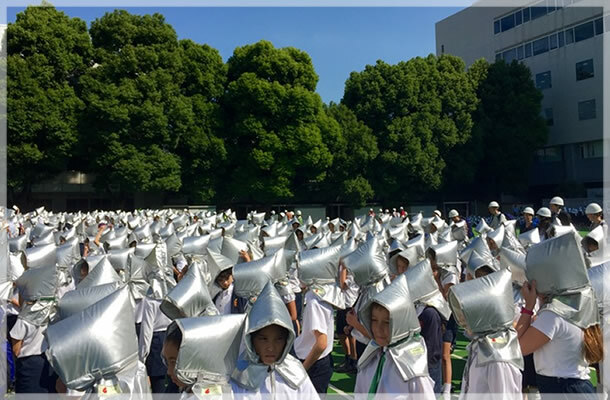 Possibly not your typical Wednesday at school back home, but here at the British School in Tokyo, earthquake drills are a fact of life and one that the students are perfectly used to. The sight of the students all donning their fireproof silver hoods and exiting calmly from beneath their desks while teachers wear hard hats and carry backpacks full of earthquake rations is a scene that quickly becomes mundane, but it is certainly one of the things that reminds me that I am in fact working in Tokyo and not still back in Edinburgh, Perth or Penicuik. Beyond that, life carries on much as back in Scotland and as you’re caught up with the everyday business of preparing classes, marking, giving feedback, assessing, tracking, reporting and dealing with the day-to-day goings-on in a busy school, it can be easy to forget that I am actually in Japan as I’m still teaching the same content that I did back home albeit to different exam specifications. The diverse range of international students that I teach still have the same struggles over the Spanish subjunctive and French irregular verbs as the students I taught back home. As a Modern Foreign Language teacher, I have always been keen to take part in and lead trips to allow the students to experience the culture and to get the chance to use their languages. For me, this is the one downside of being so far away from Europe as it’s not quite as easy to take students to Madrid for a long weekend from Tokyo, however as all our students learn Japanese until Year 11 (S4), we do get the opportunity to deepen their, and my own, experience of Japanese language and culture by taking them on homestay visits to rural Japan, to give them a taste of life very different to what they know and are used to in Tokyo. Seeing the genuine tears of sadness as the students waved goodbye to their homestay grannies and grandads really showed how much they had enjoyed being part of another family, if only for a few days. Taking part in this trip last year to the southern island of Kyushu was a real highlight of my first year at BST and one that I’m very much looking forward to being involved in again next year. As I leave work in the autumn and catch the whiff of the ginkgo nuts that have fallen from the trees and see the Japanese students from the neighbouring school, with whom we share a campus, practicing softball or kendo, I am again reminded that I am in fact in Japan. And on my walk home (no, I don’t have to get pushed like sardines onto one of the mad rush hour trains) I pass karaoke venues, noodle shops and sushi restaurants which are a little better than the ones that Edinburgh or Glasgow have to offer. Teaching at an international school in Japan has been a fabulous experience so far, as although I’ve moved to a very different culture, the job remains much the same, but I actually get the chance to use my Japanese which I never did in Scotland. And it would seem that my Japanese colleagues have forgiven me for the fact that Scotland effectively knocked Japan out of the rugby world cup!